The time spent with your kids throughout the school holidays should be fun and fruitful for all; it shouldn’t leave you feeling out of energy, out of ideas or out of pocket. Studies show strong relationships between creating art and the development of a child’s emotional and social intelligence, as well as harvesting imagination and problem-solving skills for the future. In other words, there are plenty of benefits to be reaped from getting creative! 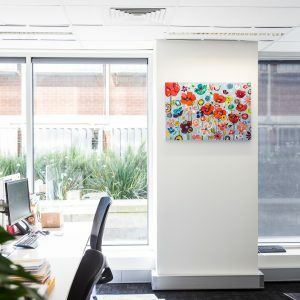 Below Bluethumb artists share their top tips and school holiday activities to put a smile on their kids’ (and big kids’) faces. Beat the school holiday boredom, and prepare yourself for a fun-filled break! 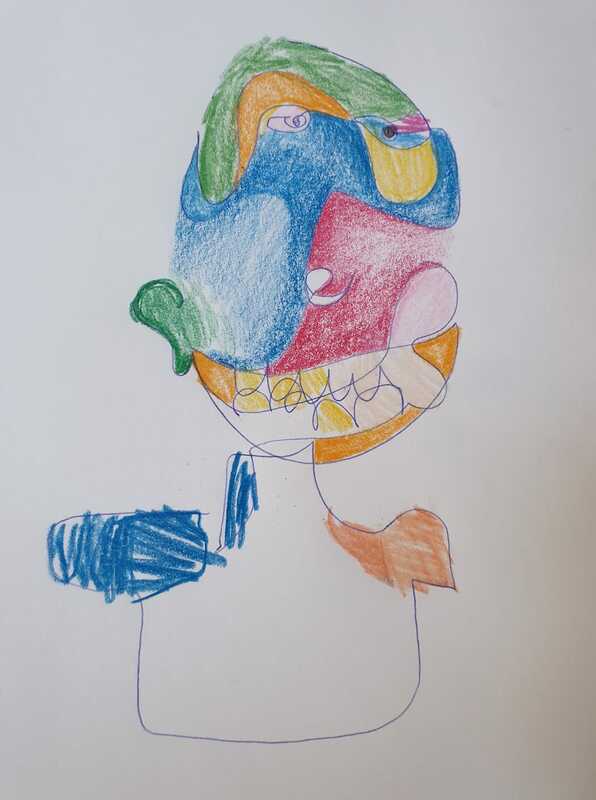 Picasso once said “All children are born artists” – and with zero fear of making mistakes and their honest, no-feelings-spared feedback, we couldn’t agree more! 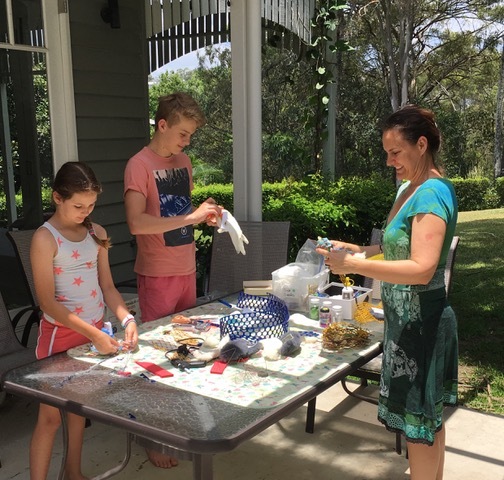 Bluethumb bestsellers Sally Browne, Patrycja Whipp and Annette Spinks agree on setting up a station for their children with make-shift paint mixing palettes (Sally suggests spare cat food containers) and old, worn-and-torn paintbrushes. “I give my daughter Honey a brush per paint colour to avoid a big brown mess at the end!” tips Sally. It doesn’t matter whether you’re artistically inclined and practise regularly or have an inch of dust on art supplies you haven’t touched in years, the school holidays are the perfect time to challenge yourself and create something, separate or collaborated! 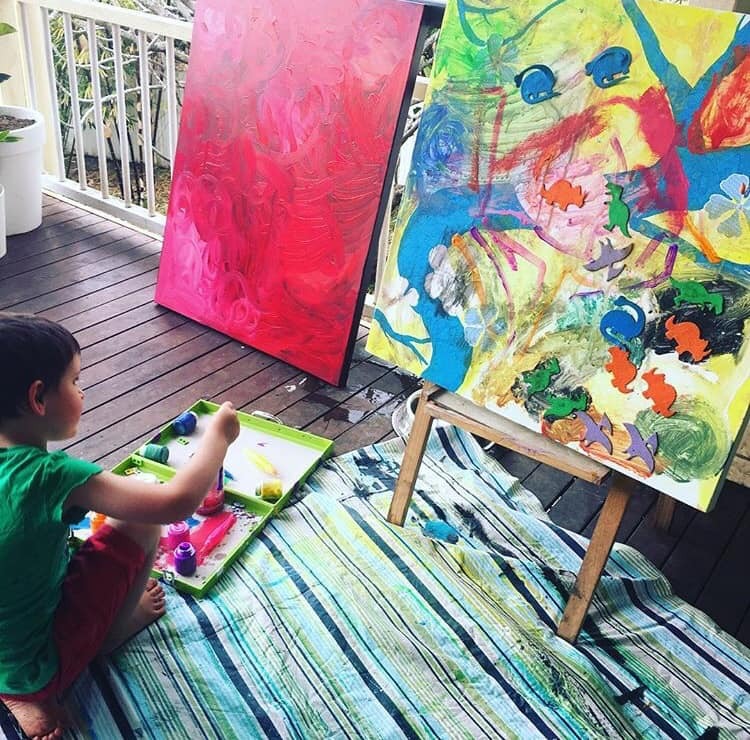 Bluethumb artist Jenn Bell is prepared for any potential mess by throwing down a plastic table cloth as her little guy paints on the deck of her studio. This portrait of Angela Hawkey by her children show us we’re in for a few laughs with this game! Who else can remember a similar game when they were young? Sometimes the old and simple ones are the best! 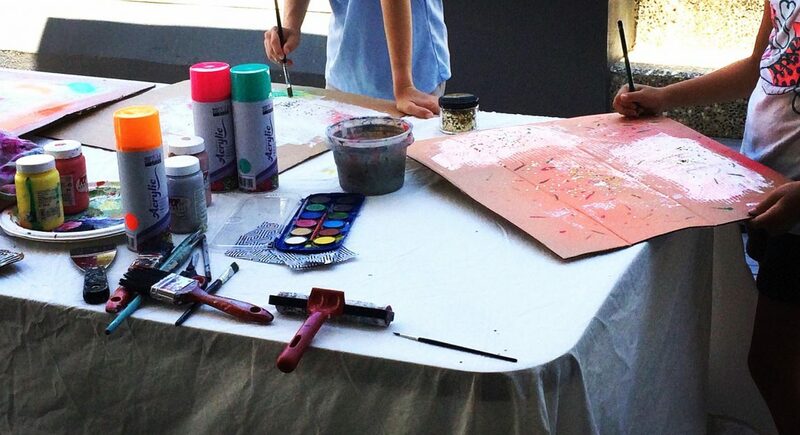 Bluethumb artist Angela Hawkey reminds us that it doesn’t take much to keep kids happy. Similarly, retired school teacher turned artist Sherry McCourt urges us to forget colouring books and the need to stay within the lines. “Put on some music, give them a Texta and let them draw to the music for 5 seconds or so. Then with the resulting squiggles, let them look for shapes that need colour. They might see animals or flowers in those squiggles.” With minimal set-up, these activities really are child’s play! Why stop at paper and canvas? Sherry also recommends getting down to your local op shop for a budget-friendly top or two, and fashioning yourself a new t-shirt. With a few fabric pens and a one-of-a-kind pattern from the budding designer in your child, this activity is a favourite with kids of all ages. 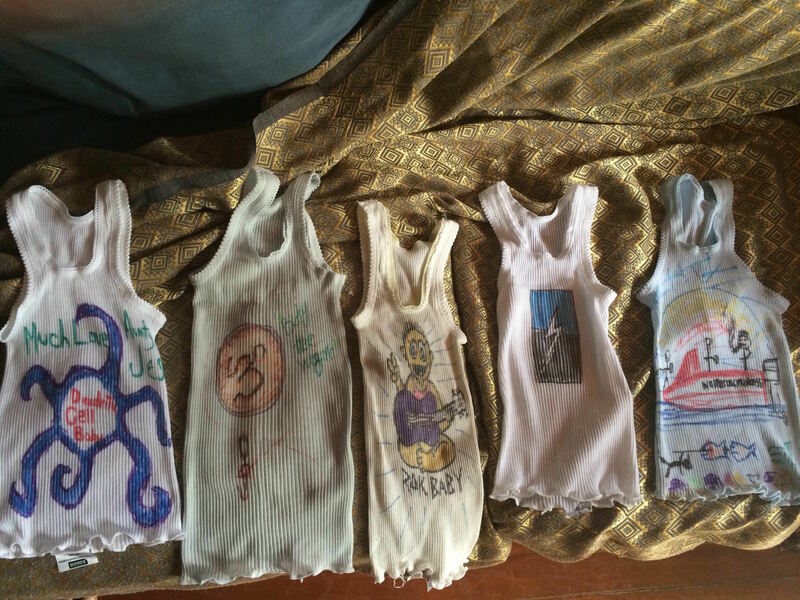 These t-shirts could be a keepsake, or ideal inventive gifts for lucky family members. 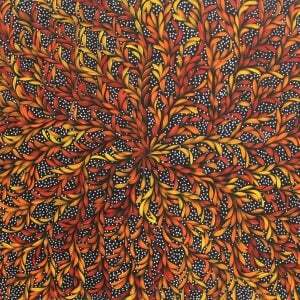 You can take it further than t-shirts; tea towels, shoes, hats… You name it, you can paint it! 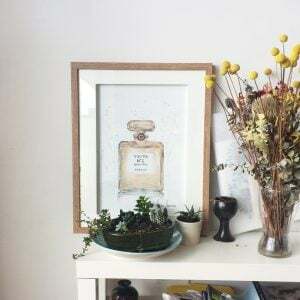 School holidays don’t have to break the bank; get down to an op shop and get designing! Thinking about a house makeover? Kids love drawing on walls – why not give your home that extra boost in character and let the kids make a memory? As children paint without the inhibition of adults, be prepared for some inventive designs that can stretch from representational pictures of animals or abstract shapes and patterns. Either way, these designs are guaranteed to brighten your day and celebrate your child’s creativity. 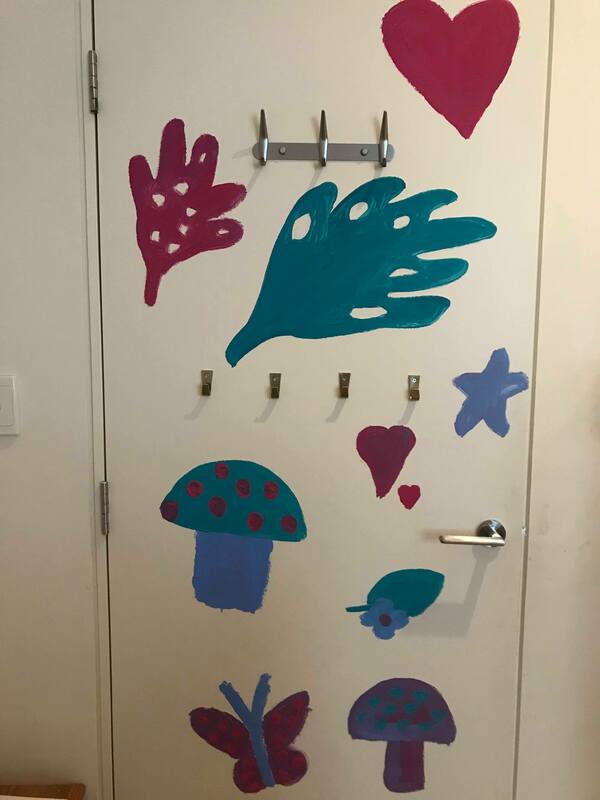 Bluethumb artist Jessika Steiner‘s daughter has turned this bare door into a piece of art! Another idea for home decor could be using the materials you have outdoors. Bluethumb artist Nicole Fearfield spends days in the garden with her children doing the odd mandala with flowers, leaves and pebbles, for instance. Linda Callaghan has also beautified her home with rocks from her garden and her grandchildren’s artistic touch! These ideas are so simple, but are sure to make memories of the school holidays that everyone can enjoy. Using a selection of rocks, Bluethumb artist Linda Callaghan and her grandchildren can leave their unique print on the house’s garden landscape! Nicole’s tip is a prime example of how art doesn’t have to be kept to canvas and paper; even better, it can help us learn to love rejected seconds. 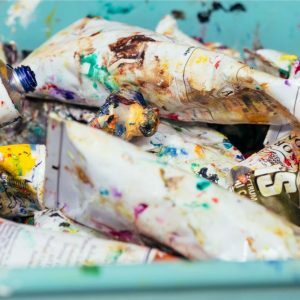 Projects and non-governmental organisations such as Reverse Garbage, which provide factory offcuts and discarded materials to early learning centres and the community, are leading the way in nurturing sustainable art activities by teaching younger ones the benefits of re-using materials and recycling resources. These projects inspire us to think differently about household waste and make use of what’s coming out of our rubbish. 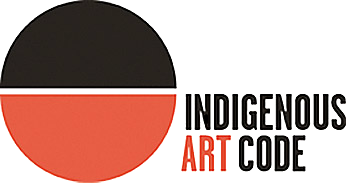 Feel good with art and activities that don’t cost the earth – literally! 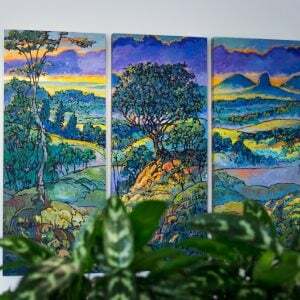 Featured Bluethumb artist Caroline Deeble is an advocate for exploring the world of art. “Visiting galleries, travelling through Europe and enjoying the artworks, sculptures & history there…. 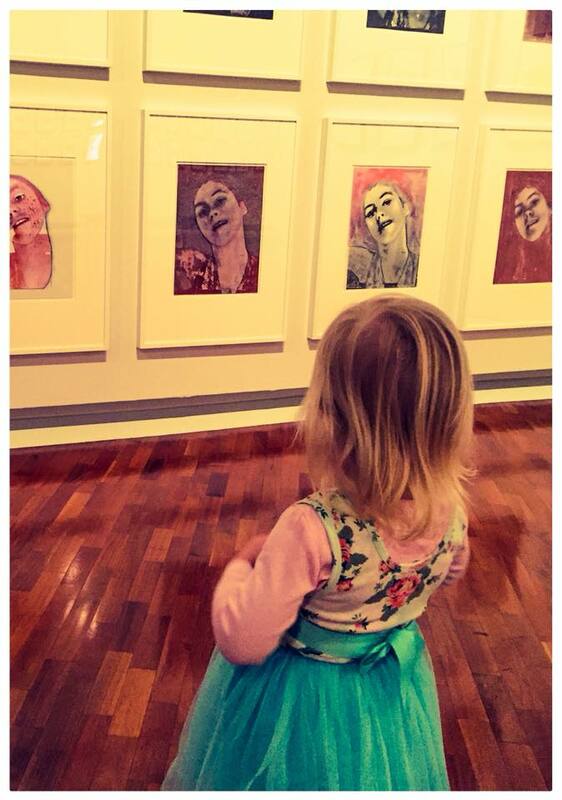 My granddaughter’s appreciation of these places was enhanced by her introduction to art throughout her life.” Getting out to art spaces, big or small, can help inspire both children and adults and boost creativity. 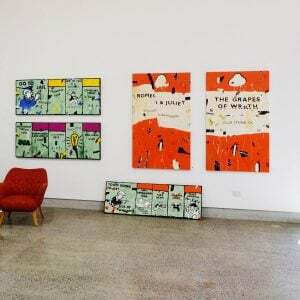 There’s no need to travel to the other side of the world to get your art fix – plenty of art spaces across Australia offer exhibitions for all, as well as learning areas for kids to get the most they can out of the exhibitions. The National Gallery of Victoria has a renowned reputation for making art fun and accessible with activities and tasks for kids all year round, and a special Summer program to boot. Hailing from Canberra, Caroline recommends the National Gallery and National Portrait Gallery of Australia to let kids and young people get stuck in with activities that promote further insight to major exhibitions. 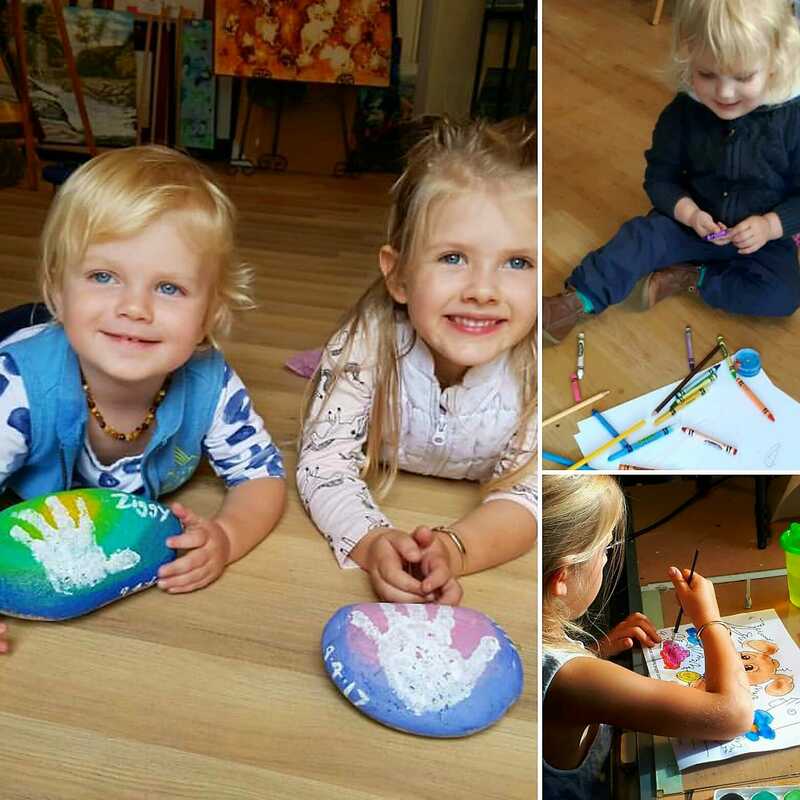 You don’t need to be a pro artist to get arty with your child. Whenever you’re stuck for ideas of how to make the most of your downtime, you can come back to these six school holiday activities again and again. Why not let us know how they go in the comments below? For further inspiration, check out our curation of Art for Kids (and Big Kids!) on Bluethumb. Your New Bluethumb Artist Profile!